Cosmic rays in the stratosphere are intensifying for the 4th year in a row. This finding comes from a campaign of almost weekly high-altitude balloon launches conducted by the students of Earth to Sky Calculus. 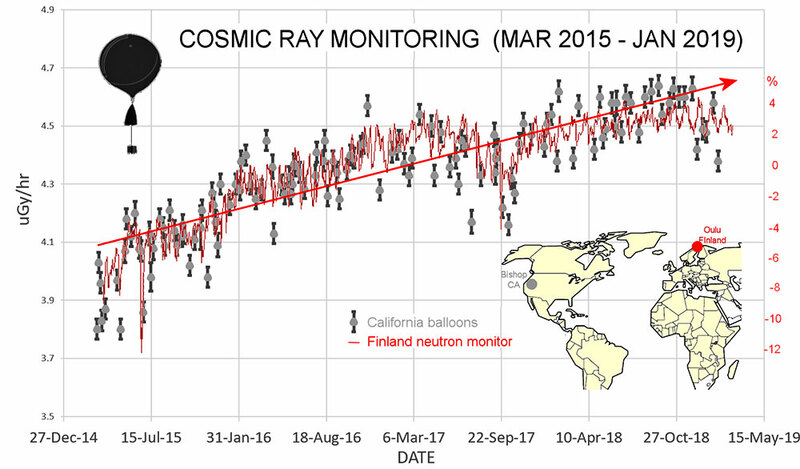 Since March 2015, there has been a ~13% increase in X-rays and gamma-rays over central California, where the students have launched hundreds of balloons. The grey points in the graph are Earth to Sky balloon data. Overlaid on that time series is a record of neutron monitor data from the Sodankyla Geophysical Observatory in Oulu, Finland. The correlation between the two data sets is impressive, especially considering their wide geographic separation and differing methodologies. 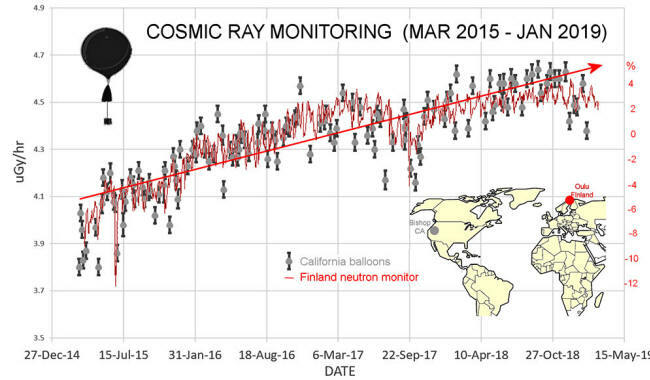 Neutron monitors have long been considered a "gold standard" for monitoring cosmic rays on Earth. This shows that our student-built balloons are gathering data of similar quality. 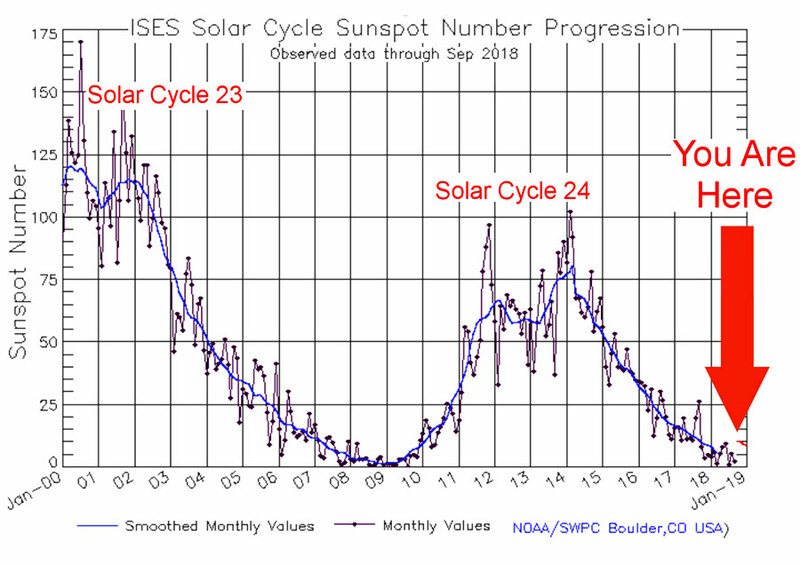 Right now, the 11-year solar cycle is plunging into one of the deepest minima of the Space Age. The sun's weakening magnetic field and flagging solar wind are not protecting us as usual from deep-space radiation. Earth to Sky balloon launches in multiple countries and U.S. states show that this is a widespread phenomenon. Cosmic rays are of interest to anyone who flies on airplanes. The International Commission on Radiological Protection has classified pilots as occupational radiation workers because of cosmic ray doses they receive while flying. A recent study (Cancer Prevalence among Flight Attendants compared to the General Population) by researchers at the Harvard School of Public Health shows that flight attendants face an elevated risk of cancer compared to members of the general population. They listed cosmic rays as one of several risk factors. There are also controversial studies that suggest cosmic rays promote the formation of clouds in the atmosphere; if so, increasing cosmic rays could affect weather and climate.